RV Slide out seals prevent outside elements from entering and insulate your RV by creating a tight fit between the slide out and the slide wall of your RV. 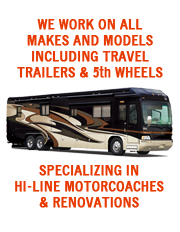 Misaligned or worn out RV slide outs and seals can cause severe damage to both the slide out room and your RV. Lubing your slide out seal is a fairly inexpensive and often overlooked preventative maintenance. Have your slide out seals inspected twice a year and lubed if necessary to maintain smooth movement and a tight seal of the slide out.